All our batters and mixes are available by the box or the case and are available for puchase in our online store. J.O. 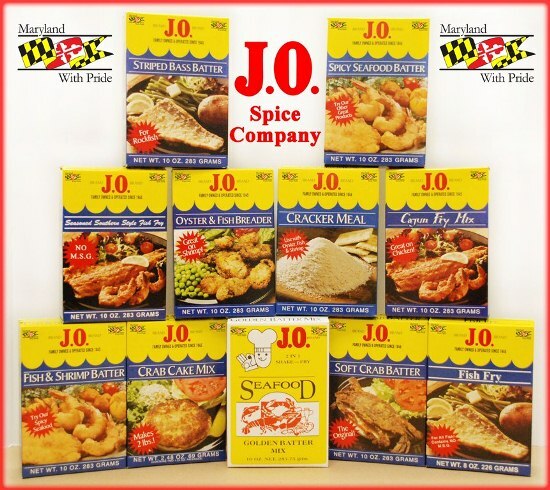 Crab Cake Mix - A premeasured blend of special bread crumbs, seasonings, and spices for Maryland style crab or fish cakes. You only need to add recommended amount of prepared crab or fish. J.O. Oyster and Fish Breader - A seasoned cracker meal base. Best for breaded oysters and pork chops. Recommended for use as a dry mix. J.O. Pork and Veal Breader - A unique blend of special cracker meal and spices to bring out the flavor of food. J.O. Chicken Fry Mix - Perfect for chicken or any poultry. The fine flour in this mix gives you that light, crispy texture that's always a favorite of fried chicken lovers. J.O. Cajun Fry Mix - A spicy relative to the original golden batter with a deep south flair. Has the perfect blend of seasonings to enhance any fried dish, especially white fish, chicken and onion rings! For use wet or dry. J.O. Fish and Shrimp Batter - An all purpose batter perfect for fish, shrimp, oysters, scallops and other seafood favorite seafood. Can be used wet for frying or dry for use in a fry pan. J.O. Soft Crab Batter - The original soft crab batter developed by a Chesapeake Bay Waterman. Easy to use. Does not retain cooking oil. This recipe has been handed down through generations of watermen. Once only available to restaurants, now you can have that great taste at home. Coat oysters in Oyster & Fish Breader. Refrigerate for a minimum of 4 hours and then coat a second time. Pan fry until done. Peel back top shell, remove non-edible parts. Add butter, margarine or grease to pan, heat until melted or until hot. Use Soft Crab Batter either wet or dry. Fry until golden brown. Other products available include Spicy Seafood Batter, Striped Bass Batter, Hush Puppy Mix with Onions and Cracker Meal.